Lock in a great price for Raffles Istanbul – rated 9.4 by recent guests! The hotel is very luxurious with attention to details. The staff members are extremely professional, courteous and helpful at all levels. The best I have seen in years. The room was great with incredible views. The breakfast was outstanding. The service was impeccable. The guys handling the luggage and helping with the Taxi were more than perfect. Amazing staff and stay!!!!! Excellent room design, decoration, professional staff, they care about details. Very nice stay with a very helpful staff especially Sena from the reception , for sure i will be back again . Every things was nice the hotel , room and the hospitality of the staff .. one of the best experience i had it in Istanbul ever. 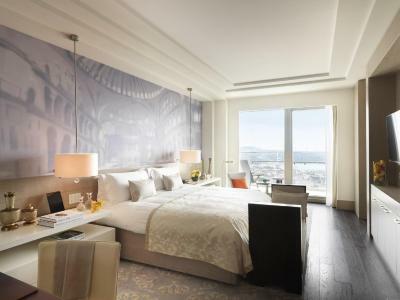 Raffles Istanbul This rating is a reflection of how the property compares to the industry standard when it comes to price, facilities and services available. It's based on a self-evaluation by the property. Use this rating to help choose your stay! 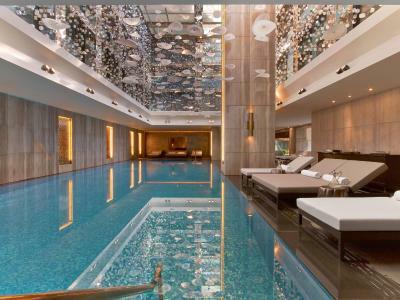 Located in Zorlu Center, Raffles Istanbul offers an outdoor pool, indoor pool and a terrace. Free WiFi access is available throughout the premises. The property features an array of facilities like sauna, fitness center, massage and Turkish bath. Each unit at Raffles Istanbul will provide you with a balcony, air conditioning and a flat-screen TV with cable and satellite channels. Complete with an electric kettle, the dining area also has a coffee machine. Featuring a shower, private bathroom also comes with a bath and a hairdryer. You can enjoy city view from the room. Extras include an iPad, a mini-bar and a CD player. 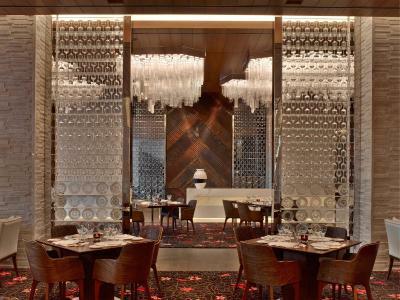 Rocca Restaurant serves Mediterranean cuisine with a Turkish influence and a buffet of dishes from around the world. Arola Restaurant by the Michelin-starred chef Sergi Arola serves a menu based on Sergi’s philosophy of creative tapas style plates. Long Bar welcomes guests and locals alike for drinks, light bites and conversation. 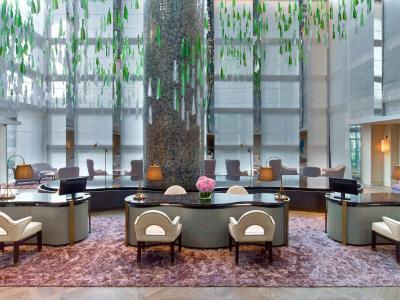 At Raffles Istanbul the 24-hour reception provides room and concierge services. Airport transfer services can be offered at an extra charge. Free private parking is also available on site. Ortakoy where you can enjoy the Bosphorus view at its best is 1.6 mi from the property.Istanbul Airport is 32 mi from Raffles Istanbul. 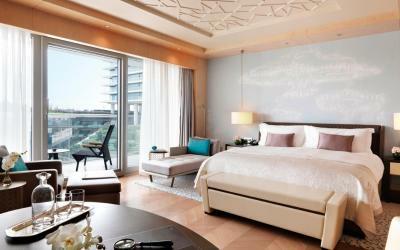 When would you like to stay at Raffles Istanbul? Floor to ceiling windows and a large furnished private terrace allow you to fully appreciate the cosmopolitan beauty of Istanbul from the comfort of your own space. Connecting and accessible rooms are available. This double room features a walk-in closet and spacious marble double-sink vanity bathroom with a separate bathtub and shower. Floor to ceiling windows lead to a furnished private terrace. Coffee and tea facilities are also provided. 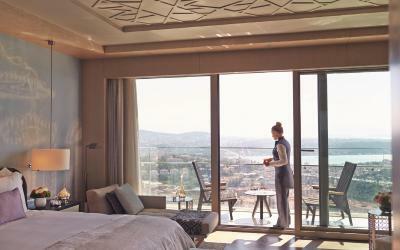 This double room has breathtaking views of Bosphorus. Floor-to-ceiling windows and a private terrace offer a spectacular panorama across two continents. 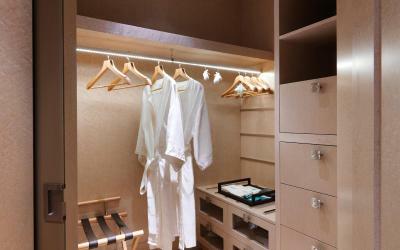 The room has a walk-in closet and a spacious marble double-sink vanity bathroom with separate bathtub and shower. Coffee and tea facilities are also provided. Guests staying in this suite have a free access to Raffles Club. 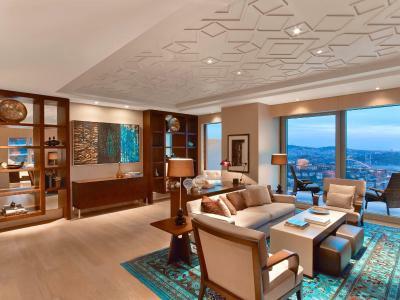 This family room is a 551 ft² corner suite features exquisite panoramas of the city and Bosphorus. Spectacular vista of the city is visible from the bedroom, living room and bathroom. The room is designed to have separate living room, bedroom, bathroom, walk-in closet, guest toilet and a make-up area. Guests staying in this suite have a free access to Raffles Club. 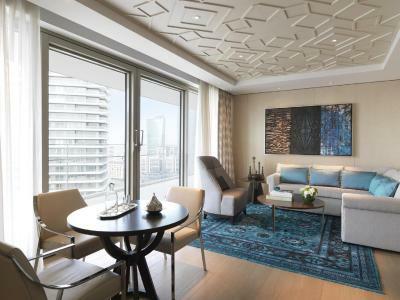 Nestled between the 22'nd and 27'th floors of Raffles Istanbul, one-bedroom apartment offers panoramic city views and some with partial Bosphorus view. Each has floor-to-ceiling windows and designed as your elegant home from home. Apartments are fully equipped with the latest technologies, separate bedroom, laundry room, living and dining areas. The kitchen is equipped with Gaggenau kitchenware, complete set of glassware, cutlery and kitchen appliances. Located on the 3'rd and 4'th floors of Raffles Istanbul, studio apartments offer 328 ft² of luxury and privacy. Look out over the twinkling cityscape or to Zorlu Center’s inner court through floor-to-ceiling windows as you enjoy this fully-furnished one bedroom apartment, complete with separate kitchen, laundry room, dining and living areas. This apartment has fully-furnished private balconies that perfectly frame the property, while the latest modern amenities including mirror TVs, a sound system and Gaggenau household appliances will ensure you’ll have everything you could ever need during your stay. Located between the 22'nd and 27'th floors of Raffles Istanbul, deluxe apartments are at the very heart of the city. 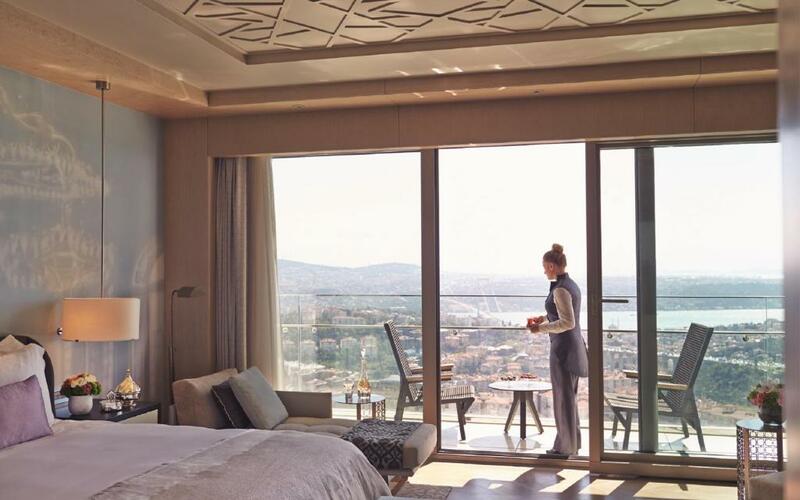 While enjoying views over dazzling downtown with partial Bosphorus views, you’ll find your palace-like residence is home to a Gaggenau-fitted kitchen and separate dining, laundry room and living areas. The Sea view apartments are beautifully furnished and includes all of the essential modern technologies such as media panels, sound systems and mirror TVs to ensure your time spent is both effortless and chic. You can enjoy the panoramic views over Bosphorus and allow yourself to settle in your luxurious private hideaway with a separate bedroom, laundry room, living and dining areas. This prestigious two bedroom apartment is located on the 23'rd floor, overlooks the timeless city of Istanbul and the ever-elegant Bosphorus from its private, furnished terrace. Kitchen is equipped with the state-of-the-art Gaggenau appliences, two separate bedrooms feature the latest technology electronics. There is also a laundry room, living and dining areas. Decorated with a blend of contemporary and Turkish design, this deluxe room features floor-to ceiling windows, air conditioning, in-room dining and newspapers all controlled by an in-room tablet. You can sip your coffee in the spacious private terrace with outdoor furniture. 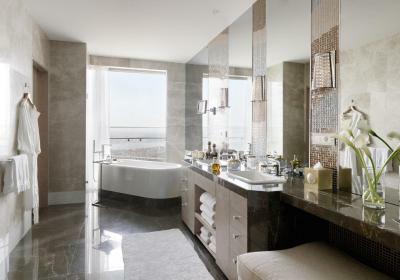 Full marble spacious bathroom offers daylight and mirror TVs. 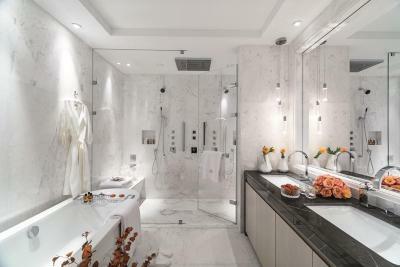 Guests can relax in the bath tub or shower and luxury aromatherapy amenities. Raffles butler service is at your disposal. Access to the Raffles Club is provided. This double room features a walk-in closet and spacious marble double-sink vanity bathroom with a separate bathtub and shower. Floor to ceiling windows lead to a furnished private terrace. Coffee and tea facilities are also provided. Guests have an access to Raffles Club with various benefits. This double room has breathtaking views of Bosphorus. Floor-to-ceiling windows and a private terrace offer a spectacular panorama across two continents. 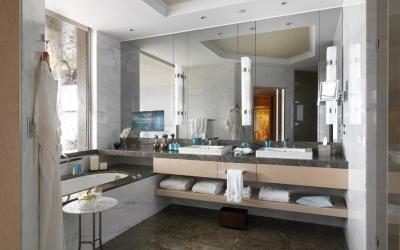 The room has a walk-in closet and a spacious marble double-sink vanity bathroom with separate bathtub and shower. Coffee and tea facilities are also provided. Guests have an access to Raffles Club with various benefits. - Access to Raffles Club with various benefits. 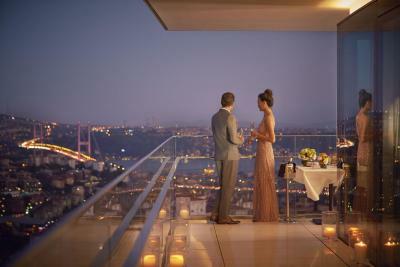 Raffles Istanbul offers a new level of luxury with amazing views above the Bosphorus. Located on the European side of the city, the hotel has excellent transport links to everywhere from the Old Town to the Bosphorus, allowing guests to fully experience everything Istanbul has to offer. Attached to the hotel is the luxury Zorlu Center, much like a modern bazaar, with upscale fashion brands as well as a performing arts center featuring musicals and world-class entertainment. House Rules Raffles Istanbul takes special requests – add in the next step! Debit card Raffles Istanbul accepts these cards and reserves the right to temporarily hold an amount prior to arrival. Raffles Istanbul accepts these cards and reserves the right to temporarily hold an amount prior to arrival. Please note that children are not allowed at the Raffles Club. Breakfast and dinner packages include open-buffet breakfast at Rocca Restaurant, chef's choice dinner with 3-course set menu including unlimited soft drinks at Rocca Restaurant. (alcoholic drinks are excluded) Please note that guests need to make reservation for dinner. Controling room lights through i pad was not freindly use.. But this not big issue. The bar was noisy and crowded on the Friday night, not somewhere to have a relaxing night cap! great experience and services provided by the staff. very luxuries atmosphere.